Cardiff City manager Neil Warnock will make a flying visit to Malaysia to discuss summer transfer dealings with owner Vincent Tan later this month. "I think that will clarify a lot of things," said Warnock, who is continuing talks to keep Gabon defender Bruno Ecoule Manga at the club. Warnock is already on the hunt to draft in two goalkeepers this summer. But the club will "wait and see" as midfielder Peter Whittingham mulls over his future. 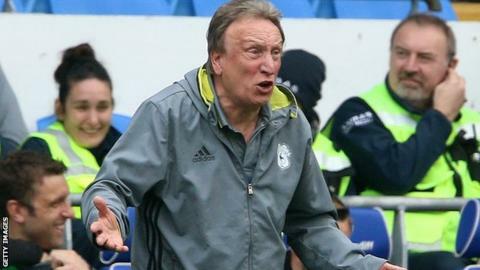 Cardiff City travel to play Warnock's former club Huddersfield in their final Championship game of the campaign on Sunday. Warnock admits he cannot wait for the season to end with his team destined for a mid-table finish. "I would say it's like extracting teeth at the minute. I just don't like football when there is nothing at stake, if I'm honest," the Bluebirds boss added. "Either one end or the other I can get my head around but making the numbers up I can't. "I ask my lads to make sure we perform and they have done if I'm honest. " Warnock already has his eyes firmly fixed on a promotion challenge next season and has instigated a face-to-face meeting with Tan at the end of May to finalise plans for summer recruitment. "I met (chairman) Mehmet Dalman and (chief executive) Ken Choo this week, now I am going to fly out to see Vincent towards the end of May which will be good. It is my request really," he said. "It is ok on the telephone, but I think when you want to talk about numerous things about the club, you have to sit down face to face. "There are certain situations I want to speak to him about you cannot do that on the telephone when your are hard of hearing, like me." There are growing indications Manga could be a part of the Cardiff squad next season, with Warnock having initially been pessimistic about keeping him on reduced terms. "I will be discussing him when I go across to see Vincent and talking to his agent in the meantime," Warnock said. "I think he is enjoying playing for me. The circumstances could not obviously be the same as before but I look at him and since I have been here he has played very well. "I think we have the three best centre-halves in the division." Midfielder Whittingham has also been asked to accept less money and there is more uncertainty over the 32-year-old's future. "We have had a good chat and both laid the cards," Warnock said. "Peter has to see what develops for him. There might be clubs that can offer him a more lucrative contract or offer him the opportunity to play more regularly." With Hull City loan goalkeeper Alan McGregor set to return to his parent club, Warnock says the club have spoken to "five or six" potential signings as he bids to sign two goalkeepers for next season.